Have a Marvelous Monday! Let’s do this! We all could use a bit of motivation to get rolling on Monday. On Mondays, I like to share a Mantra or short inspirational message. If the message resonates with you, use to motivate yourself in training or life. Do you have your own awesome Mantra? Please share it below in the comments. For the past mile and half my legs were on the verge of seizing. My quads screamed from the previous 23 mile effort. I was a mile from my 6th marathon finish, and my goal time was in sight. All I needed to do was run the last mile without slowing down. My body was screaming at me to slow down and walk. My face was a picture of pain, and it felt like someone was punching me in the gut. I made the final turn, and could see the finish. I picked up the pace slightly, and my legs protested. Now my body and my mind were telling me to quit, just walk, it will ok. I would not relent. This was not just the finish of the race, but a finish of four months of training and sacrifice. As I crossed the line, I raised my hands in gratitude for being able to run such a distance. I finished one minute over my original goal. It was still a huge PR, but most importantly, I knew I had given full effort. There is nothing worse than the feeling of doubt, knowing you could have done more. I know from experience. That voice in my head telling me to slow down has a won on some occasions. I only have my self to blame for my lack of effort. When you fight through the resistance and push through the pain, there is no sweeter feeling. You are in full control of your life and actions. Instead of comparing your times and efforts to others, your only measure should be your own full effort. If you are giving all you have it is a victory, no matter what the result. 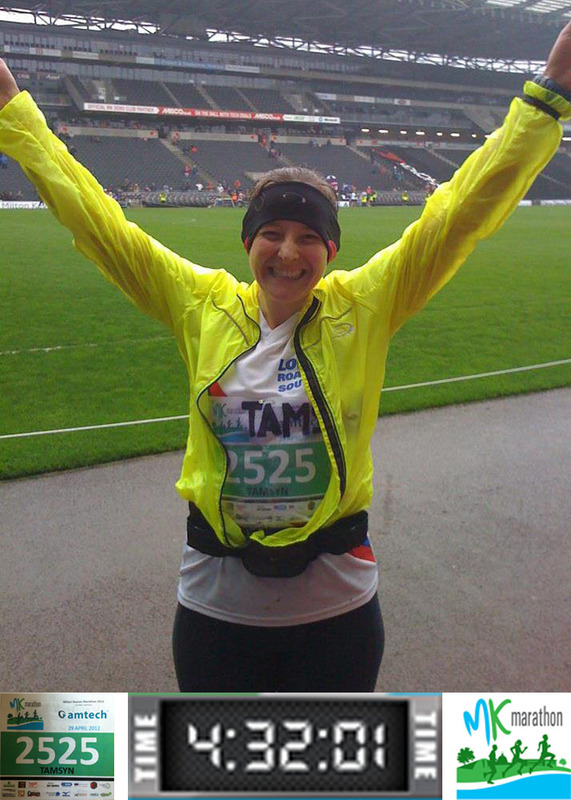 Here’s a photo from the end of my first ever marathon in April 2012. It was cold, wet and windy and the course was flooded and rerouted, so I had to run an extra half mile, but I did it 🙂 Since then I’ve run another 4 marathons and have started doing triathlons. What a great smile on what looks like a tough day. Way to persevere toward your goal. Check out Tamsyn’s blog, she is very entertaining, and gives great info from her point of view. Please consider sharing your own photo to inspire others who are working toward their own finish. It doesn’t have to be from a triathlon, just any race that has special meaning to you. If you are interested in sharing, please send a message to firstimetri@gmail.com.